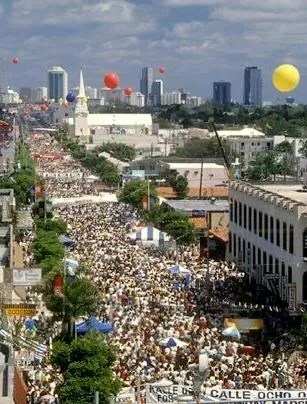 This week’s Miami Medical is set around the fictional Calle Cubana festival, which is obviously based on Miami’s annual Calle Ocho Festival. It’s something I wasn’t familiar with at all, but which sounds wonderful! Calle Ocho is an actual street in Miami (SW 8th Street) and the architecture of the area (although Miami is a relatively new city) is based on the art deco architecture of Havana. There are all sorts of events as part of the Festival, one of which is an enormous party (24 blocks are closed off, and there are 30 live music stages). I’m guessing that the mayhem our Alpha Team are dealing with this week spins out of the fictionalised version of this party. 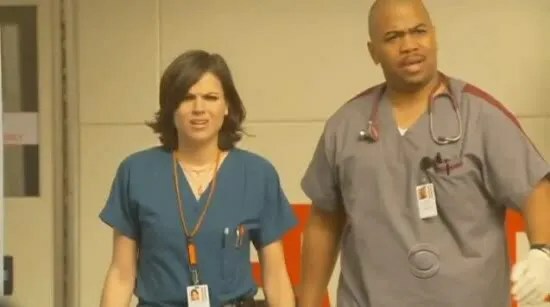 Dr Proctor and team are not exactly leisurely under normal circumstances (there’s always a fair amount of yelling for gurneys, dashing down corridors, and charging in and out of elevators with patients who seem to crash the minute the elevator doors close) but this week we are promised a bigger than normal workload, so for goodness sakes don’t blink!! HotDocProc fans will have to be slightly patient (pun not intended but I’m pretending it was…) because I suspect he’ll be too busy doctoring this week to be revealing secrets, but we will be rewarded next week, I’m told, and let’s face it, we did pretty well last week! Having said I’d like to see more of Tuck, this week the poor man comes a cropper, I hope it wasn’t the chicken (see SueVo’s post for more info on this!). I also said I hoped we see more of Dr C…seems we will, he takes his shirt off! So, Friday night is Miami Medical party night! You know the drill by now: tell ALL your friends to watch, because we all need to get as many people to watch this show as possible if we want to enjoy a second season. That’s the reality. Thanks for the information. I hope your son is hale.